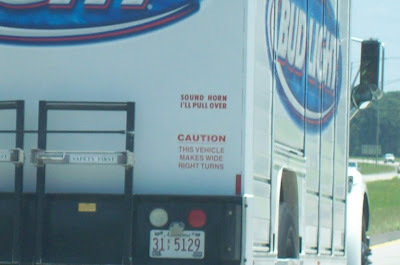 I was driving down the highway recently (before our beach trip) when I noticed this Bud Light truck. Not being a beer drinker, I probably wouldn't have paid any attention to it if my eyes hadn't locked on the lettering at the far right. "Sound horn. I'll pull over." I was absolutely intrigued. We were going 70 miles per hour, and I REALLY wondered what would happen if I honked at him. Would he pull over on the side of the interstate and sell me some beer right off of his truck? THAT IS SERVICE. I cannot TELL you how badly I wanted to honk at him, just to see what would happen. But I was truly in a hurry to get to the other side of town, and I just didn't have time. 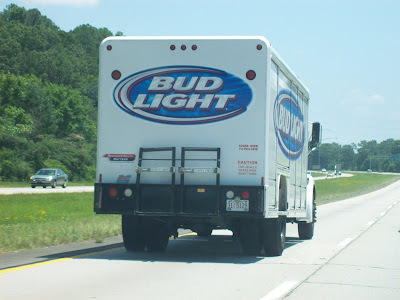 Of course, NOW every time I get in the car I'm looking for a Bud Light truck so I can honk at it. Amy, I've regretted not honking almost every second since.